I admit it. Sometimes, I sort of drift away from 2000AD. Can it really sustain such quality week on week? So I’ve not read it in a month. How well will I fare diving back in mid story in places? Could anyone just get stuck in? Now, first and foremost, I’m always a sucker for MacNeil’s art. Whilst Ezquera’s art is of course seminal, for me MacNeil’s has always felt the most dynamic and cohesive to me – when you want to concentrate, he draws the eye expertly. Coupled with rich colouring from Chris Blythe, they ground this story and establish a very different mood to your conventional Dredd tale – which, being set in the Eire of the Megaverse, works perfectly. With Dredd investigating an attempted hit on a former Emerald Isle judge who’s relocated to the Big Meg, we are drawn into a political thriller that, whilst a step away from the wry commentary we are used to in Dredd, works brilliantly. It’s great to see folk playing in the Dredd sandbox and having a new take on it after all these years – impressive stuff. One of the more recent series (and one that’s well worth picking up previous trades of) to grace 2000 AD, Rennie’s excellent Harry Absalom is the Gene Hunt of supernatural coppers, a brilliantly old-school copper stuck doing his job in 2015. His job, however, is more than your average boy in blue – he makes sure the peace between Her Maj’s government and the forces of Hell are maintained. It’s a dark, sniggering romp that has shades of early-80s Constantine, only less sinister than Gaiman and less surreal than Morrison. Crucially, with this story centering on a Church-sanctioned teen assassin, you can still make perfect sense of what’s going on even though we’re at part 5. It’s not to say that it’s not disturbing – it most certainly is, and is an effective vehicle for exploring the hypocrisy of the Church and the fate of those in its children’s homes. However, this manages to be fun throughout, mostly through the sharp and appalling inappropriate dialogue from dear old Harry, achieving a difficult balance with gusto. With its cartoonish, cel-shaded art style and steampunk overtones, I was fully expecting to dislike Helium. However, it works well in this tale of a post-apocalyptic world on 3 levels: a floating world of survivors (where the action takes place), a “poison belt” of biological warfare agent soup wherein dwells a mutant civilisation, and a surface-world of biodome-dwelling technocrats. As these worlds begin to collide, we see it all unravel. It’s a bit spotty in places; it’s tough to have a fresh take on such dystopia – but the key is the bright, shiny art, which acts as the perfect counterpoint. With a tough, no-nonsense cop (aren’t they always? ), a steampunk golem and a mad scientist racing to prevent all-out war, this has real potential as a new thrill. I’m not going to lie: I found Outlier confusing – but then, that is absolutely the point. When a survivor from alien experimentation seems to go rogue on the alien ship he’s helping you investigate, would you trust him? Questions of trust, identity and choice abound in this compelling tale of humanity at war with an incomprehensible foe. It’s bloody, grim, and unremitting – and I love the fact that it has completely blank, blacked-out panels. This is a cinematic comic at its best. We assume that we’re to think that Carcer, the survivor, is to be sympathised with, but as he spirals out of control we are desperate for him to be stopped. This is another strange new thrill that I’ll be keeping a close eye on. A long while back, I mentioned that I was crazy excited for the return of Jaegir, hands-down the best new thrill of the last 15 years. It’s the counterpart to the legendary Rogue Trooper, but told from the other side of humanity’s ceaseless, futile civil war. Jaegir is the daughter of the Nort’s greatest general, and she is driven by honour and duty in a time where these are seen as luxuries one cannot afford. She has been sent to investigate atrocities committed by her father’s own unit, The Kashan, the fiercest and most feared of all Nortlanders. The Aryan parallels are obvious, and the storyline seems inevitable, but you just know that it’s all going to unravel in unexpected ways. With Len O’Grady’s washed-out palette beautifully complementing the human horror, this is fascinating stuff, with Rennie giving us chilling insights into the character’s back story. Absolutely the high point of the issue, going out with a bang in more ways that one. 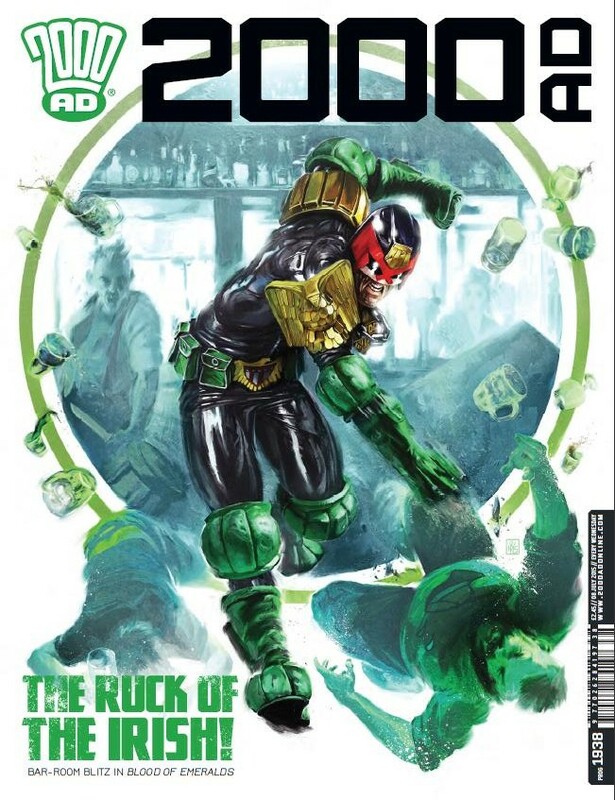 2000AD is like an old mate. It grabs you in a headlock, wrestles you to the ground, laughs and then buys you a pint. The least you could do is go grab a copy and return the favour. You’ll not be sorry.